The Whiskey Rabbi Returns to the Ghetto! A Budapest friend of mine stopped me in the street recently and asked me if I still wrote about music on my blog. "Whenever I look at it these days, it seems to be something about food." The truth is, there is still a lot of music going on around here, and being a musician, I often find myself in the middle of it. Writing about music is something I used to do for money. (Actually, so was writing about food.) But if you keep up on what has been happening in Hungary for the last few years it might seem odd that somebody would avoid commenting on the social and political upheavals that command almost every conversation here and focus, instead, on cream filled dainty pastries and pork chop marination. Actually, this blog began in 2006 while we were working in Istanbul, fascinated by the magic things Turks can do with ground meat. Hungary only became a blog topic the night a mob of beer-addled right-wingers attacked the Hungarian TV station, driving the terrified police away and sacking the building. I spent my last evening in Istanbul in a teahouse with some Kurdish friends watching the news on TV while they worried about us returning home to a Budapest in flames. In the nine years since the political situation hasn't much improved. "Don't cheat! Don't steal! Don't lie! Because the Government doesn't like competition." Let's just say pork chops and cheese pastries are a far safer topic for online publication about Hungary these days and leave it at that. Life is complicated. So if I am not going to stand up and sing about the Wretched Human Condition in a language anybody can understand (my specialty is singing in a language very few can understand) I can at least let those who do save on hotel bills by sleeping on my sofa. And thus Canadian singer-songwriter-Whiskey Rabbi Geoff Berner spent a few days off from his European tour schedule wandering the Budapest Ghetto. Geoff has never been a stranger on these pages. He's been shaking things up in the Canadian indie music world with provocative songs based on Jewish themes and elements of Klezmer music, most recently with his CD produced by Josh Dolgin Victory Party. A mere 12 bucks on Amazon kindle! 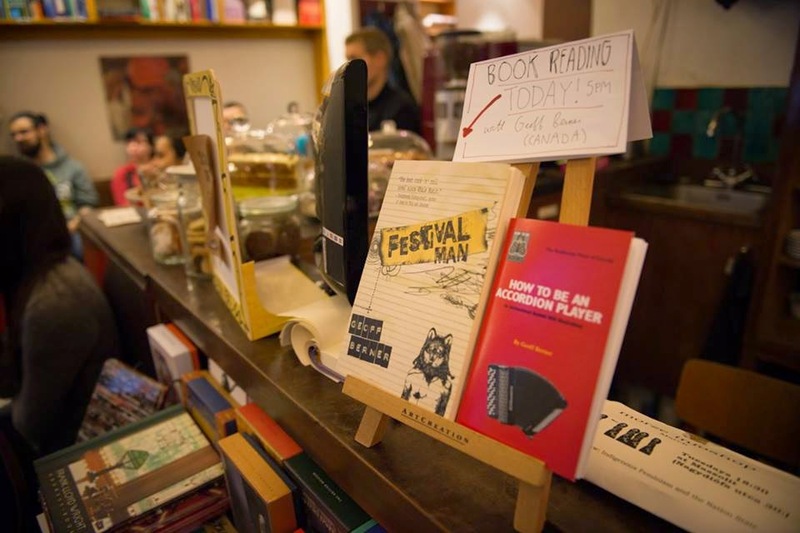 Geoff did a reading from his first novel Festival Man at the Massolit bookstore - conveniently located just down the street from us in the Seventh District. Festival Man was required reading on the Brothers Nazaroff tour bus last summer, and although it is about the Canadian festival circuit, it rings true to anybody who ever hoarded artists backstage beer tickets at a large summer festival. Geoff also did a gig at the Aurora, a club - cultural center - speakeasy in the eighth district that is run by the folks who used to operate the late, great Siraly Club on Kiraly utca, a cafe and night spot that managed to encompass a cafe, a Jewish library, two not entirely licensed bars, and a theater in a squatted bit of downtown real estate, eventually shut down by none other than our ridiculous pomposity of a Mayor for allowing students to organize demonstrations in their basement. They finally found a space in the funky eighth district to carry on their mix of politics, avant-semitic culture and truly unbearable late night DJ remix parties. But this matters little to me. Berner was the man who introduced me to the Montreal Deli Chez Schwatz's, home of the best smoked meat sandwich in Canada. Now it was time for payback. We took Geoff to Kadar's Etkezde. We have often discussed Kadar's on this blog - Google even shows a photo of my parents eating there if you check them for images. Simply, it is probably the best Hungarian food available in Budapest. It will never win a Michelin star, it is only open for lunch, they usually run out of their specials halfway through the daily service, and it has been creeping its prices up to near restaurant levels (it is an etkezde, a tiny "lunch place" and like all etkezde, used to be dirt cheap.) But Kadar's is better than all other tiny lunch joints, and most restaurants as well. Kadar started out as the hobby restaurant of a hotel chef, whose wife made classic Jewish solet - the Hungarian version of the Yiddish Sabbath meal cholent. I will go out on a limb and say that Kadar's solet is possibly the best Jewish bean stew available in a commercial form on the planet Earth (I can't speak for extraterrestrial Jewish bean stews served on other planets, like Meta-Plonsk and Planet Goldstein-12.) Usually it is only available on Friday and sells out by 1pm, but there was a layover batch when we arrived on Monday and so we got the ideal three day old cuvee version, which is considered vastly superior, a creamy moist blend of beans and barley mixed with paprika and onions. That is a roasted goose leg sitting atop the beans up there... the Hungarian Jewish all purpose stand in for pork. Solet is one dish that crossed over from Jewish cooking into Hungarian cusine, although most Hungarians know solet as something eaten with smoked pork, which is also delicious, but as you may well have guessed, it is as unkosher as it comes. Kadar isn't kosher, the orthodox in the nabe avoid it, but it used to serve comfort food to the old Jewish communist functionaries who maintained a home in the old Ghetto district, and eventually became a magnet lunch joint for actors and theater directors. Another standard here is the beet salad - seen in the photo above - topped with home made grated horseradish which will blow the back of your head off. Goose on rice. This lives about two minutes away from where I am now typing this. Goose also appeared on the specials list as "Goose risotto" but it was basically old fashioned goose meat pilaf made from carcass meat - simmered into a broth for cooking the rice and the meaty wings and bony backs then roasted. and set on top. This is my idea of a light meal. Goose fat is what the Jewish world in Hungary used to cook with - Hungarians use pig lard as a basic shortening, even today. huge flocks of geese were once a common scene in many Hungarian villages, mostly used for their fat and livers, while the meat was considered a cheap by product fit for making into soup stock. Duck was a more widely used meat in Austro-Hungarian cooking. Duck isn't as universal on Hungarian menus as it is in the Czech Republic or Austria, but Kadar usually has something ducklike on the menu - keep an eye out for Breaded Fried Duck Liver with mashed potato, a deceptively simple dish I have given up trying to recreate at home. Just like Mama used to make, if you were born to my Mama. On our second trip to Kadar in as many days Geoff went for the duck leg with cabbage and noodles. This stuff is what I was raised on, pure Bronx Hungarian soul food. When we were kids in the Bronx my family lived in an Italian neighborhood - the East Tremont area just short of Throggs Neck. P.S. 71 was my Alma Mater. My fathers best friend was Sicilian, the neighbors were Abruzzese, and most of the street were from Naples. The Bronx families we grew up among were constantly eating, ignoring meal times and digging into vats of Italian-american food that were forever cooking on the basement stoves (nobody ever lived in the upstairs rooms. Ever.) We kids gorged on pasta, lasgana, flat breads, and anchovies, but when the Caiolas came to our house the Patrone would always request duck. Nobody makes duck like my Mom. A reasonable facsimile is what they serve at Kadar's. We don't eat at Kadar's all that often, but when guests - even from Vancouver - are in town it is always on the list.